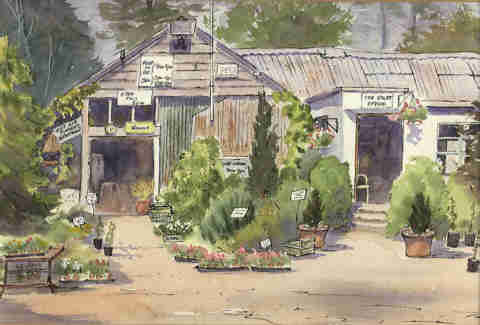 MacPennys nursery itself was bought around 1934 by Mr. Douglas Lowndes from a lady who grew drought resistant plants and sold them in small pots for one penny each. Her name was Marcia Ashley-Corbett, hence the name MacPennys. All the early plantings were made by Mr. Douglas Lowndes, including many rare trees and shrubs, camellias, rhododendrons azaleas, heathers and many more unusual ericaceae. Douglas Lowndes continued to grow alpines and herbaceous plants until the War when he changed to growing vegetables and other produce for the War Effort. In 1951 an old and derelict gravel pit was purchased as an extension to the original MacPennys nursery which has since become the Woodland Walks. Since 1977 MacPennys has been owned and run by the late Douglas Lowndes son Tim and his wife Vivien, now joined by their son Simon. MacPennys is also the home of the original MacPenny Long Life Label, which is still made on the premises and sold around the world. Naturally, it is also available from MacPennys. The great storms of January 1990 caused much damage and many of the large Euchryphias and Embothreums were destroyed and have since been replanted. The area has since increased from 5 to 17.5 acres - all currently under production. Many rare and unusual shrubs, woody and herbaceous plants are still grown there and can be purchased from the Sales Office all year round.